What’s Goin’ On In the Studio…. Man, I’m finding it hard to get into the studio this month, we’ve got so much stuff going on. I was starting to get a little freaked out because I only have 20 paintings for the WineFest Art Show, then I remembered that originally, my plan was to create 15 pieces! OK, I’m good, and if I happen to get a few more done, then that’s bonus nachos…. Jesse and Teresa (wonderful nephew/niece) took the Octopus Painting, and seemed to be quite thrilled with it – their appreciation and enthusiasm for the piece is VERY flattering! 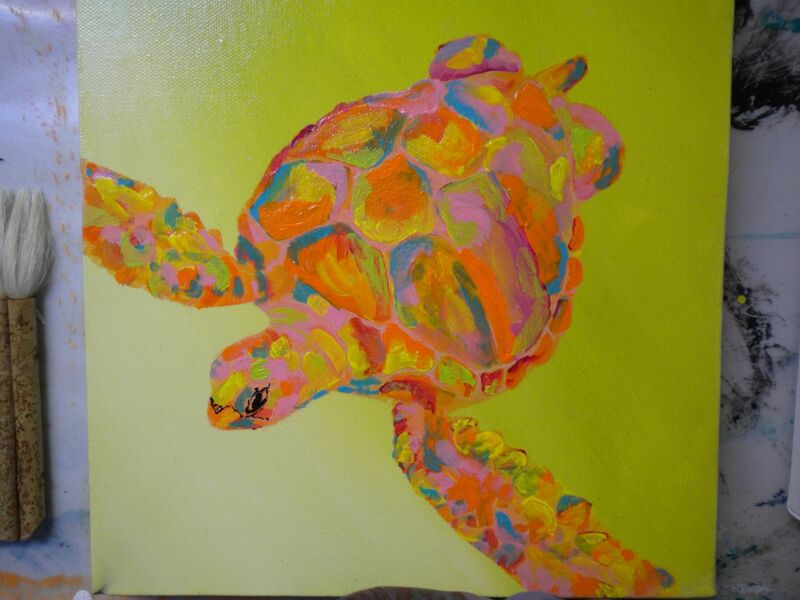 – Start a small 10×10 turtle painting, which is TOTALLY not working. 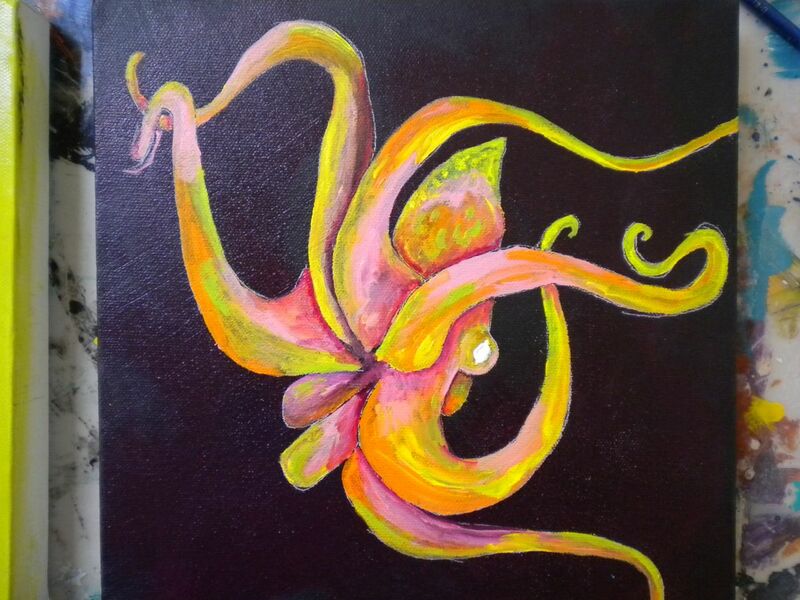 I’m going to re-do the background, as it’s too similar to the colors in the turtle, sigh…..
– Start a small 10×10 Octopus painting, which is fabulous so far. 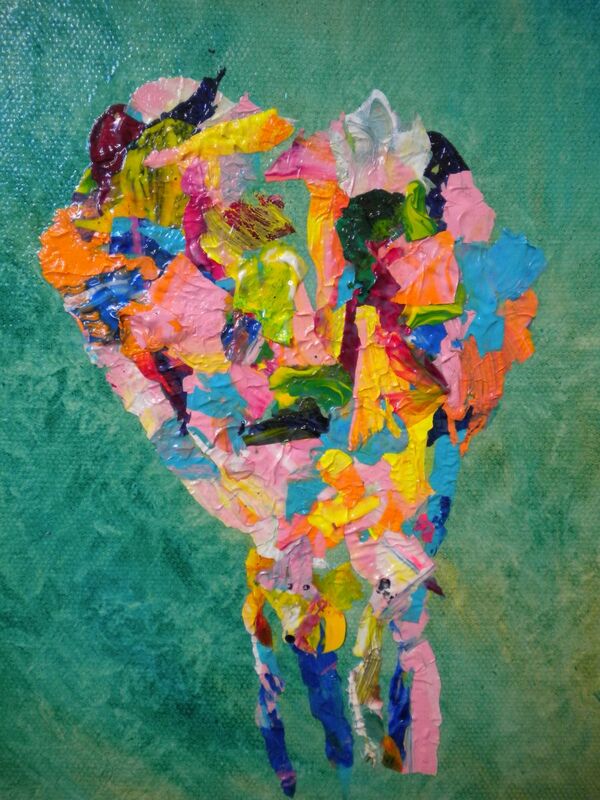 – Start a Leftover-Paint-Scraped-Off-The-Table-And-Stuck-Onto-Canvas painting, a la Bob Burridge. This particular style cracks me up. I know you’re looking at this and going ….uhhh, whaaaat? ?…., but trust me, once I do some negative painting it’s going to be great. It will end up being a pair of swallows sitting together on a wire. And now I’m going to go lay in the sun……..
2 Responses to What’s Goin’ On In the Studio…. I can actually see those swallows. Look forward to the finished version…that and the turtle. Love the octopus. Boy, you must be good at “Where’s Waldo” too! !